Since I really enjoyed The Coldest Girl in Coldtown, I started paying more attention to Holly Black. This book didn’t hit me quite the same way, but it is still a fun read. There’s something really pleasing about her heroines in both books: they know what they want and they go after it. Even when they flounder about a bit, there’s a certainty to them that I like. Hazel, the main character here, occasionally (okay, more than occasionally) makes idiotic decisions, but she does so with a purpose. It’s always understandable and I’m often left wondering if maybe she’s right. And when she’s wrong, she acknowledges it, which is another rare and attractive quality. I didn’t feel much of a connection with Hazel (it’s possible I’m aging out of YA, at least a little bit), but I liked her. The book also provides an interesting look at how easily some pretty horrific things can be normalized such that both the characters in the book and the reader reading the book don’t think too much about it… until someone points out that, wait, no, what you had been accepting for so long is actually not acceptable. Only the most obvious example of this is how cruel, tricky and magical the fae are, but also how accepted they are in the town of Fairfold. They’re a dangerous and disturbing part of life in this town. People just carry on… until they can’t anymore. 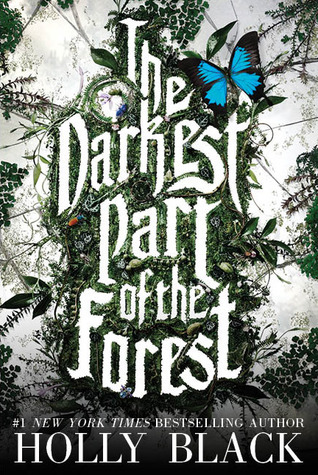 This entry was posted in Fantasy, Young Adult Fiction and tagged Holly Black, The Darkest Part of the Forest. I loved Coldest Girl in Coldtown so much that I tried to read some of her other stuff, including Doll Bones, which had gotten rave reviews everywhere. But that one was waaaaay too middle reader for me. But maybe I’ll try this one, since it sounds like it’s got some edge to it. I’ve read this now and I cosign everything you said here. It wasn’t quite as compelling as The Coldest Girl in Coldtown, but I enjoyed it a lot. And my favorite part was definitely how the fae and the town had this weird relationship that everyone just seemed to accept even though it was pretty objectively horrible.